A simple lecture demonstration is described to show the latent presence of metal atoms in a metal salt. Copper(II) formate tetrahydrate is heated in a round bottom flask forming a high-quality copper mirror. 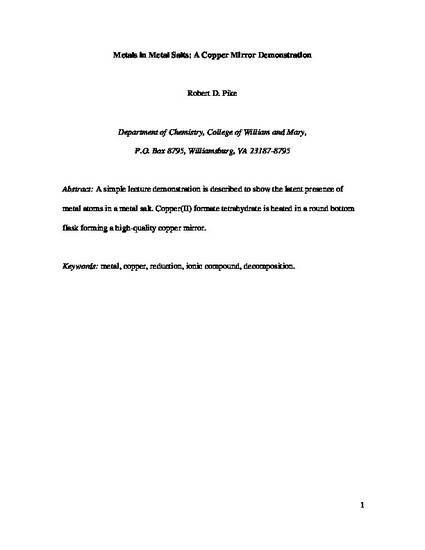 This document is the unedited author's version of a Submitted Work that was subsequently accepted for publication in Journal of Chemical Education, copyright © American Chemical Society after peer review. To access the final edited and published work see https://pubs.acs.org/doi/ipdf/10.1021/ed1000075.